You are here: Home / Fixed Income (Bank FDs,RDs,PF etc) / New EPF Composite Declaration Form-11 for automatic EPF Transfer on change of Job! EPF Form 11 is a declaration form which has to be submitted by an employee when taking up new employment in an organization which offers EPF Scheme (Employees Provident Fund). This form contains basic information regarding the employee like – name, date of birth, contact details, previous employment details, KYC (Aadhar, Bank account, PAN etc) details. As of now, when you are joining a new employer, and if you have contributed to EPF in your previous employment then you have to submit new Form No. 11 (Declaration form) and Form No. 13 (for PF transfer from old EPF account to you new EPF account) for offline EPF transfer. The EPFO has recently enabled an online EPF transfer facility as well. The EPFO has now come up with one more initiative – when you change your job, you no longer need to transfer the funds from your old EPF account to new EPF account by submitting Form – 13 (or) through online facility which is available on Unified member portal. Instead, at the time of joining new employment, the employees’ (EPF members) can now give details of their previous EPF account in new revised Form 11 with effective from 20th September, 2017. Once the old EPF account details are provided in new Composite Declaration F-11 form, the funds will be automatically transferred by the EPFO to new EPF account. 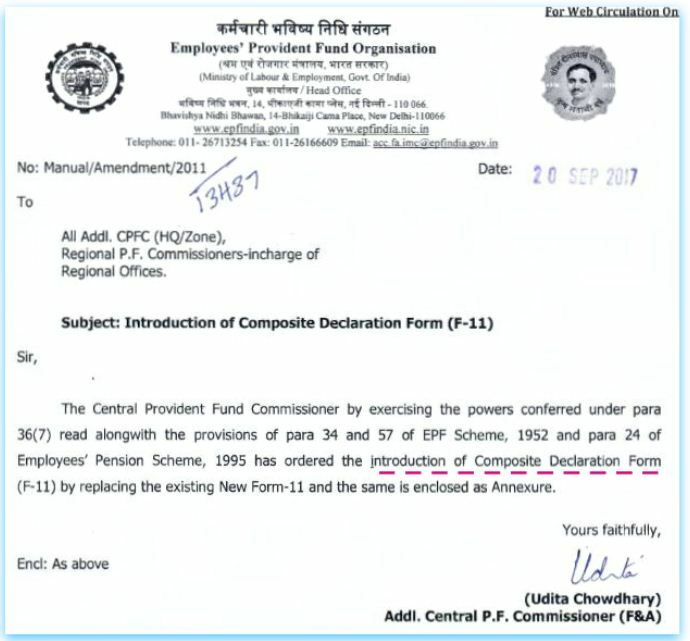 It has been decided by the EPFO that the new composite declaration form (F-11) will now replace existing Form 11 & Form No 13 in all cases of EPF auto transfer. 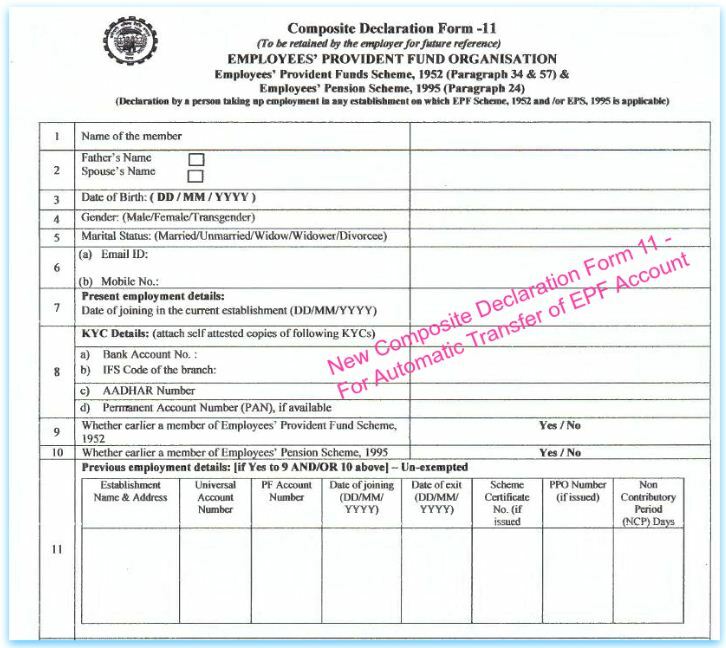 Henceforth, the below new EPF declaration form – 11 should be used by the employers to collect the declaration details from their employees and also in case of EPF automatic transfer claims. If your UAN was Aadhaar seeded and verified, the declaration by the employer in Form-11 for transfer request made by the employee will trigger an auto transfer process which will transfer the accumulations against his previous EPF Member-ID to the New PF Member-ID. Your personal details like Name, Parents name(s), Date of Birth, Gender, your Marital status & Contact Details. You have to provide your KYC details like – Bank account number, its IFSC code, Aadhaar number & PAN. You need to provide date of joining of current establishment/company. 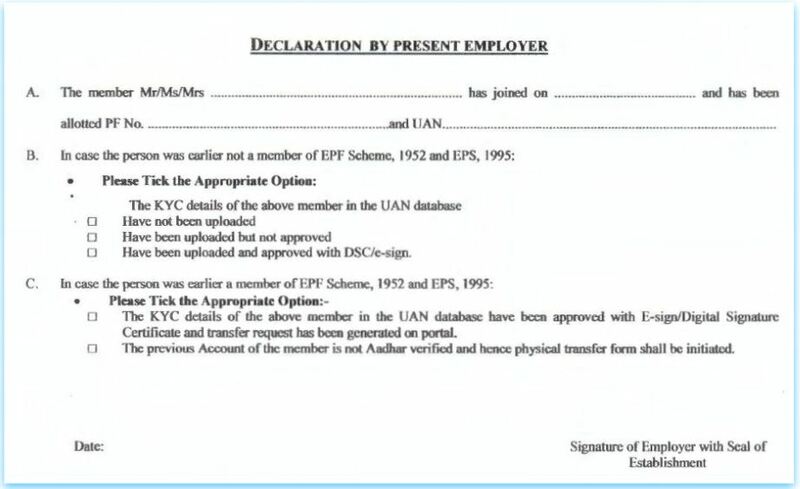 If you have been employed earlier and contributing to EPF scheme, you have to provide your previous employment details like – Company name, your UAN, EPF account (Member-ID), Date of Joining, Date of Exit etc., As you are providing your existing UAN number, the chances of being allotted with multiple UANs can now come down. You need to sign the declaration form and submit it to your current employer. Your employer will then provide their declaration (authorization) details and take appropriate action for automatic transfer of EPF account (if any). An auto-transfer would be initiated once first payment in respect of the new employee is received from the present employer against the UAN flagged for auto-transfer. An SMS and e-mail (if registered) will be sent to the member once the transfer is auto initiated. How to stop Auto-initiated PF Transfer Claim? The member can request to stop the auto initiated transfer either online using the “Stop Auto Initiated Claim Cases” functionality provided in the “Track Claim Status” link under “Online Services” tab in the Member Portal (or ) through present employer (or) by approaching the nearest EPFO office within an outer limit of 10 days of receipt of SMS informing the member of auto initiation of transfer request. In case, the request to stop the auto initiated transfer against a given UAN is not received within the stipulated 10 days from either of the member, the auto EPF transfer claim will be processed. In case, your previous EPF account has not been Aadhaar verified, your employer may initiate offline/physical transfer of your PF funds. Kindly note that the Auto transfer of previous PF account would be possible in respect of Aadhar verified employees only. (c) EPF transfer from or to an exempted establishment, then the member needs to apply for transfer in Form-13 as per the existing procedure for physical transfer (form 13), for transfer of account from the previous establishment. It has been estimated that the EPFO receives around 1 crore different type of claims, including EPF withdrawal, pension fixation, death claims and EPF transfer claims. The transfer claims constitute 10-15 percent of the total claims filed by subscribers. Hence, this new initiative may prove to be beneficial to EPFO staff, employers and EPF subscribers as well. How to withdraw EPF online? Interest on Dormant/In-operative EPF Accounts! I have a query regarding PF transfer from Old employment to new. My previous employment Date of Exit 22 Jun and my current employment joining date 28 May, So I am unable to transfer my old pf money to new PF. Please suggest what is the solution. What is your correct date of exit? Accordingly get the correction done with your ex-employer or current employer..
sr mera Contractor pf transfer ni hora hai kya kya company aur contact number alag Hota Hai plzz sms my number 97811056**..
May I know your exact query plz? Are you referring to Member Id (EPF ac)? If so, an employer can create a member-Id and allot it to their employee..
Dear sreenivasulu..Suggest you to submit your grievance to the EPFO to speed up things..click here..
Are you referring to EPF balance? Did you withdraw PF from your current (last) employer? It may not be of an issue for transfer or withdrawal of funds. But, suggest you to get your father’s name corrected in UAN. You need to submit a joint declaration form to the EPFO through your employer. Kindly contact your employer in this regard. 10 days back i have joined new company , but my old company EPF amount withdrawal i have applied through online . (Note:- after resigned my 1st job 8 months i was a unemployed to join 2nd Compnay, ) . Issue is i have applied my 1st company PF amount withdrawal through online , but two day back my PF status is “Under Process ” Today status they have “Rejected” due to I have joined New company . As you are currently employed and contributing to EPF scheme, you can not make full PF balance withdrawal. Kindly get your funds transferred from your old EPF a/c to current EPF a.c.
My name is appearing in Aadhaar as K.Duraivelu but in UAN it is appearing as K DURAI VELU. When I tried to link aadhaar to UAN, it is not accepting the fullstop (.) special character. Can I submit as K DURAIVELU and link ? I believe the mis-match may still happen due to special character ‘.’ in Aadhaar card. You may better off correcting your name in Aadhaar. I am not able to transfer the PF from previous company as Date of exit has not been entered. My previous employer is not co-operating to add Date of exit. Please explain the offline process to transfer the PF. If your Aadhaar has been seeded to your UAN, you can submit CCF-Aadhaar form directly to the EPF regional office (where your account is being maintained) by post. Kindly enclose, cancelled bank cheque, pan card copy, Aadhaar card copy and form 15G(if required). I was working in an organization that had its exempt PF Trust. My current organization maintains PF with the Regional EPFO. Can an Auto-transfer be done from exempt Trust to EPF? Dear Patnaik ..I dont think auto-transfer is possible. You may kindly check with your new employer on this! If it is not possible, you may have to opt for offline transfer of funds. I am trying to transfer of previous epf amount to current epf account through online. But I am getting error. In my epf short name while in aadhar card full name. Due to this happen name mismatch. Now what can i do? Kindly read : How to correct name against UAN card online? I am just learning the process of transferring my old PF account balance (with previous employer whom I left two years ago). I realised that my new organization did not seek my previous PF account details, as a result of which, I now have two independent UANs and PF accounts – one in Maharashtra and new one in TamilNadu. I am now trying to merge the two UANs and transfer the accumulation in my Maharashtra PF account to my current TamilNadu one. However, I no longer use my Maharashtra mobile number which has been registered and my dob details also dont seem to match in that account. Hence, I am unable to retrieve the password of my old UAN/ account. Please share any guidance on how to proceed here as my old account seems to be lost without the credentials. You may try transferring the funds from your old EPF ac to new EPF account through new UAN login. If this does not happen, you may submit offline request for transfer through your ex-employer. My new organization has asked to fill Form-11 as mandatory which asks all the details like existing UAN. What should I do If I don’t want to transfer my old pf amount instead I just want to create new pf account in the new company. I know that we have the option to answer ‘NO’ to option (8) and (9) and hence leaving (10) as empty. But the KYC details(bank account,aadhar,pan) looks mandatory. I doubt whether filling this details would make my application as auto-transfer from old pf account. please clarify. Please confirm whether I need to provide ‘NO’ in the option (8) and (9) to disable auto-transfer from old pf account. Your new employer will create new EPF account (member-Id) only, but you need to share your previous establishment’s UAN to your new employer. If you are going to contribute to EPF scheme in the new job, you need to mandatorily transfer your old EPF account funds to new EPF account. I have now updated the above article with ‘how to stop auto-initiated EPF transfer claim’? procedure based on the revised guidelines. Now I am doing transfer of PF amount from Previous employment PF account to current PF account, but I am getting below error while transferring the same. Dear Ganesh..Your personal details between the two EPF accounts may not be matching. Kindly read : How to transfer EPF online? If online transfer is not possible, you may take your current employer’s help and get the funds transferred offline. We are paying EPF challan (Administration charges) every month. All the persons in our organisation draw basic of above Rs 15000/-(fifteen thousand) and as such do not come under the purview of mandatory PF enrolment as per the Employees’ Provident Fund act 1952 and subsequent amendments. Pl. let us know how to file nil return for epf? Dear VS.. I am not aware of the employers’ side EPF procedures. You may consult a CA or the EPFO. I joined my current organization last year i.e. April 2016. However i have not yet initiated any online or offline transfer of PF from my old to current organization. In this case, can i make use of this new facility (Form 11) instead of going for Form 13 or online transfer? Your current employer might have already collected your employment and EPF details through Form 11, when you joined their Org. So, may be, an online EPF transfer is a better option.